My little girl got her first vaccines yesterday, so we stuck close to home afterward, just the two of us. We cuddled and she napped a lot. Fittingly, the day was as rainy and chilled as my mood. While she napped I decided to make something “back-to-school”ish, to prepare for easy meals when I go back to work in a few weeks. I LOVE homemade muffins. I like to freeze them fresh and defrost a few in the microwave for breakfasts for me and the toddler. He gobbles them up and begs for more! One of my students in my public speaking class four years ago gave a memorable speech on making muffins, showing how easy it truly was to give up the box mix. I’ve never looked back. The biggest secret she shared was not over-stirring. You want a slightly lumpy batter. These muffins were based on a recipe from Libby’s Pumpkin, but the original recipe called for 3 cups of flour to 3 cups of sugar. I had to reread that… 3 cups of sugar? This recipe includes whole wheat flour and a lot less sugar. Feel free to double the spices, or even add in a teaspoon or two of vanilla extract. These would be less healthy (but even more delicious) with cream cheese frosting. If you add frosting, make sure to freeze them “naked” and add it when you defrost the muffin. Preheat to 350° F. Paper-line or grease minimuffin cups. 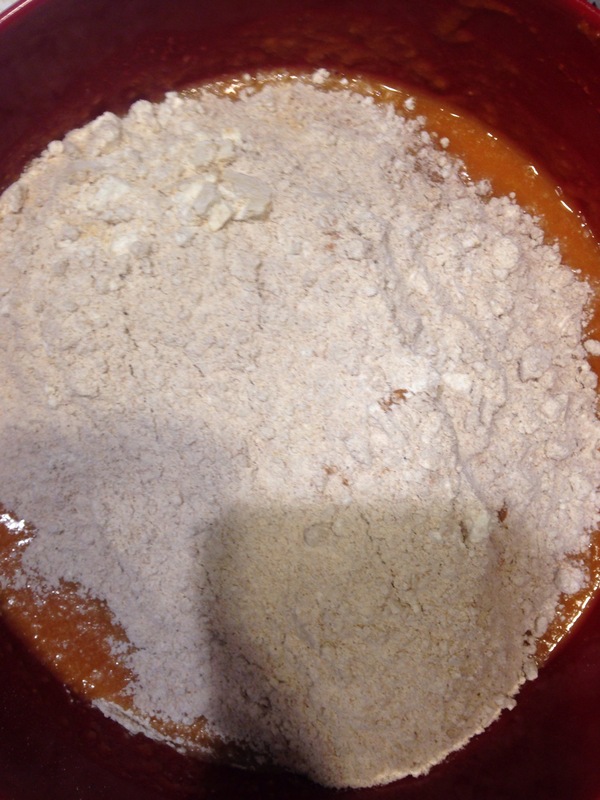 COMBINE flour, spices, baking soda and salt in large bowl. 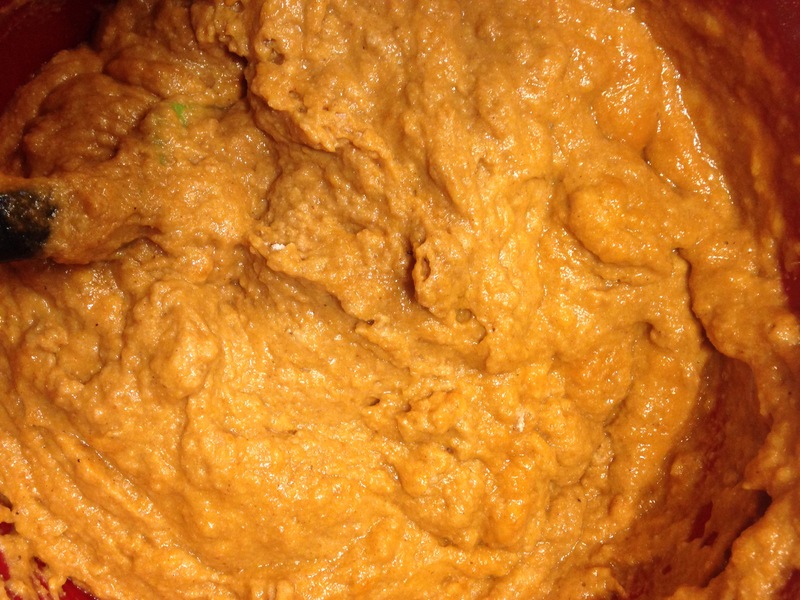 Combine sugar, maple syrup, pumpkin, eggs, oil/applesauce, and juice in large mixing bowl; beat until just blended. 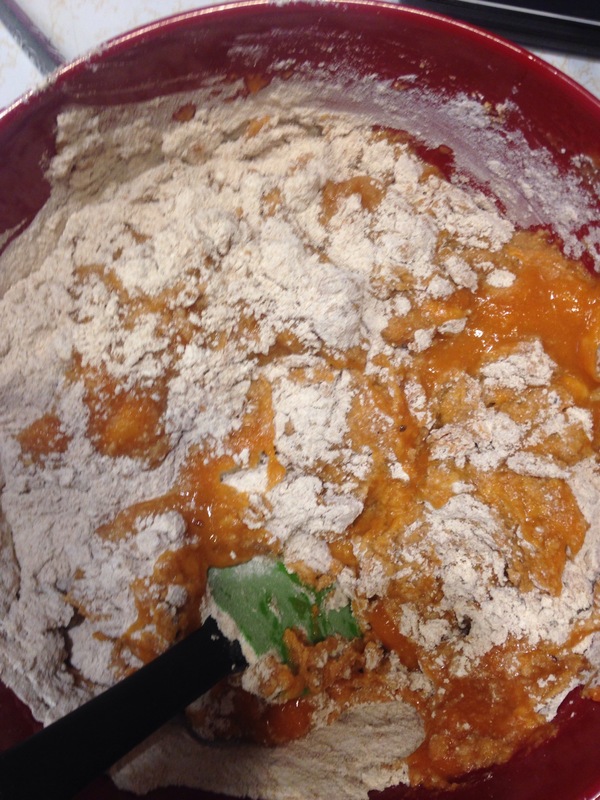 Add flour mixture to pumpkin mixture. Stir just until moistened… (see pictures below) There will be lumps! Spoon batter into prepared muffin cups, filling 3/4 full. BAKE for 15-17 minutes or until wooden pick inserted in centers comes out clean. Cool in pans on wire racks for 10 minutes; remove to wire racks to cool completely. Store muffins in covered container or resealable plastic bags. Can freeze for up to three months. Great reheated! There will be lumps. Don’t over beat!